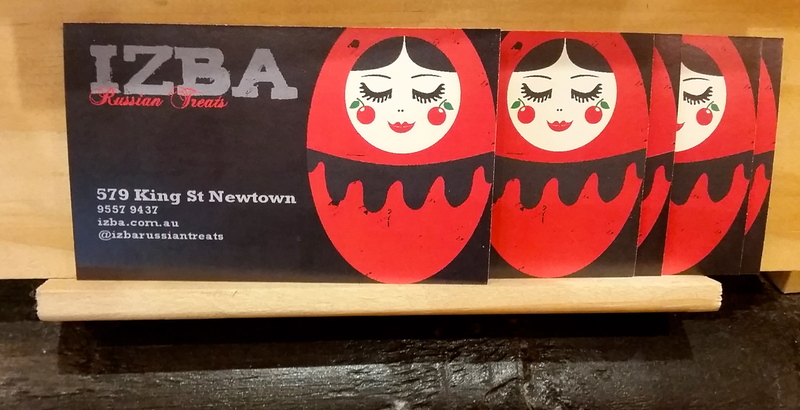 Opened by Olga in mid 2014 at 579 King Street in Newtown, Izba Russian Sweets is a patisserie like no other, in that it is the only Russian patisserie you will find in Sydney. Seeking a space where the customers are open-minded and have adventurous palates, Newtown seemed like the right kind of place for the exotic fare you will find there. 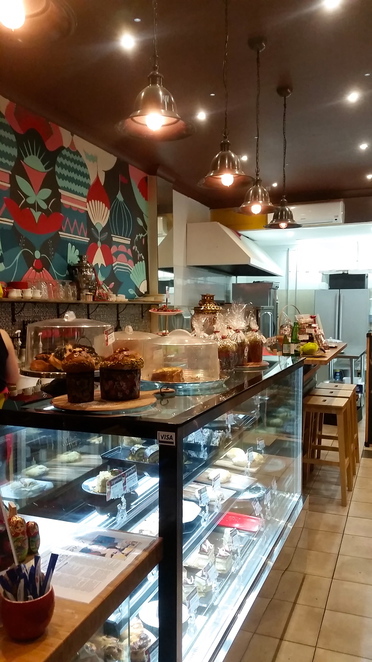 With Russia steeped in the tradition of a home being filled with the warmth and aromas of baked goods, on Olga's arrival to Australia, she began sharing her love and talent of baking with the people around her. Her traditional Russian delights were so highly sought after that her husband encouraged her to make her passion into a real-life patisserie. 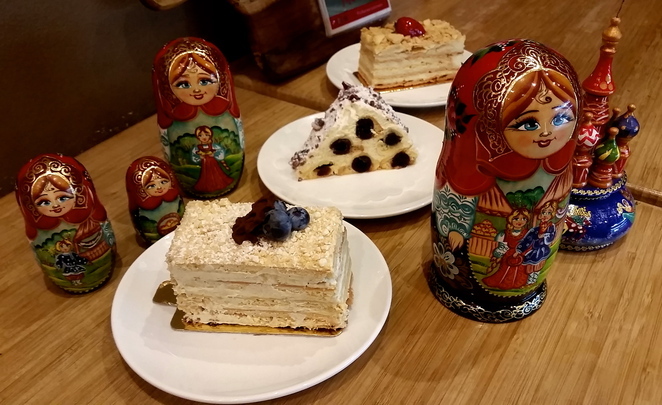 To keep up with demand, Olga has now handed her traditional family recipes over to two highly qualified pastry chefs, to ensure that these lovingly created treats continue to flow from the in-house kitchen. You can truly taste the history, the heart and the soul, that goes into these marvellous morsels. 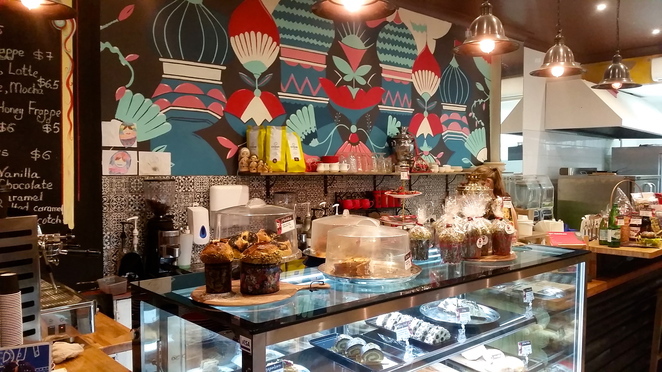 There is a wide variety of sweets and savouries, including vegetarian and gluten-free options, plus Russian beverages too. Not to mention specialty breads for festive occasions, such as Easter. First on the menu for us was the Salmon Pie, the perfect way to dive right into the Russian eating experience. 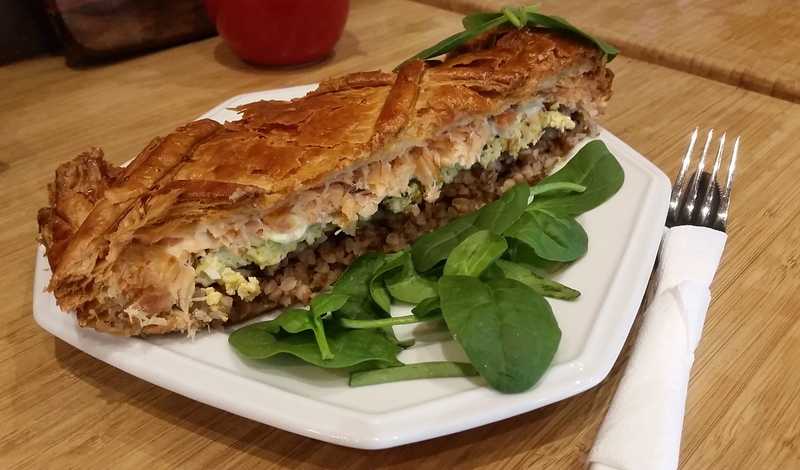 Fresh and superbly flaky pastry encases a generous layer of smoked salmon, boiled egg and an interesting and tasty addition, buckwheat. The buckwheat may be unusual to some, but it added great texture with its chewiness and a lovely nutty taste. Our next course was the famous Blini. Some may think it's just a pancake, but as we found out from Olga, what sets the blini apart from those similar, is the use of yeast in the batter. With yeast as the raising agent, it really aerates the batter, giving it a light and porous consistency, ready for wrapping up delicious sweet or savoury fillings. For the gluten intolerant, there is also a buckwheat flour blini option available. 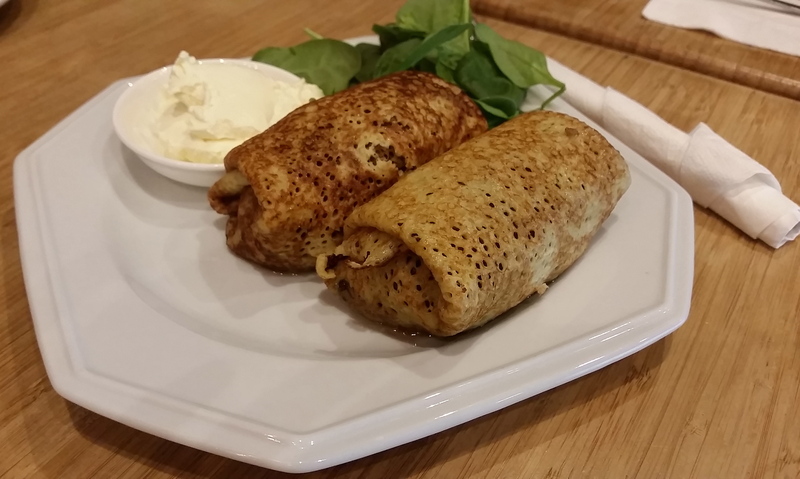 Our blini was filled with minced beef and caramelised onion, served with a side of sour cream. Sounds simple and that's what makes it so good. These hot parcels with the sweetness of the caramelised onion and the savoury beef, carried by the blini and topped off with the rich sour cream make for one very satisfying meal. As if this wasn't a spread-and-a-half already, we were yet to be presented with the stunning array of Russian sweets they had in store for us, the part I undoubtedly look forward to the most. 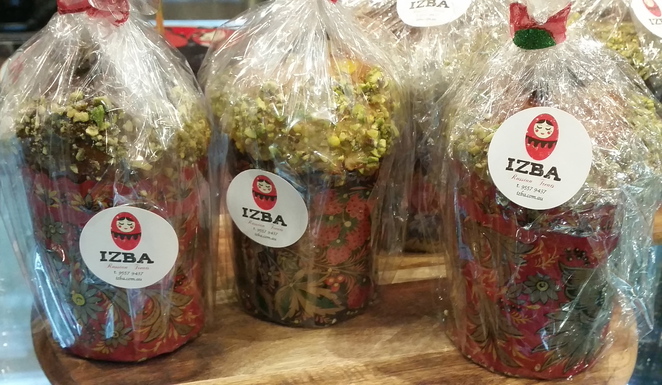 We started with the signature dish of the patisserie, the Izba Cake. Sharing its name with the patisserie itself, both being inspired by the architectural wonder of old-time Russia, the wooden hut called "izba". A feat of intricate construction, this cross-log cottage design is a symbol of comfort and family life in rural Russia, being reinterpreted in this sumptuous sweet treat. 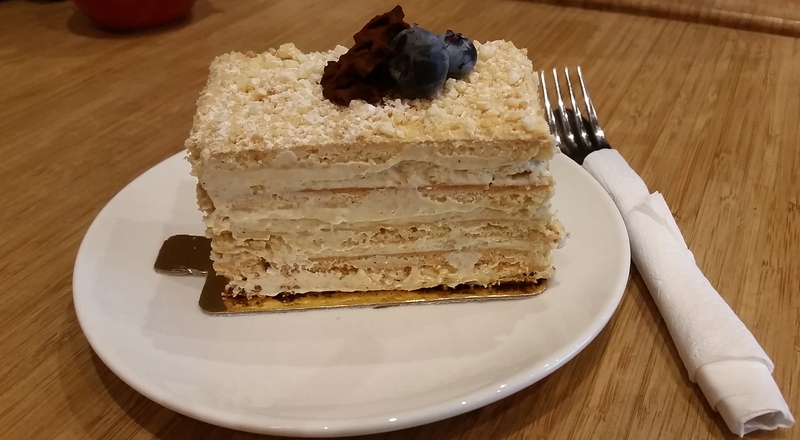 I was so looking forward to endeavouring into the rich world of Russian sweets and the Izba Cake did not disappoint; in a word, divine. 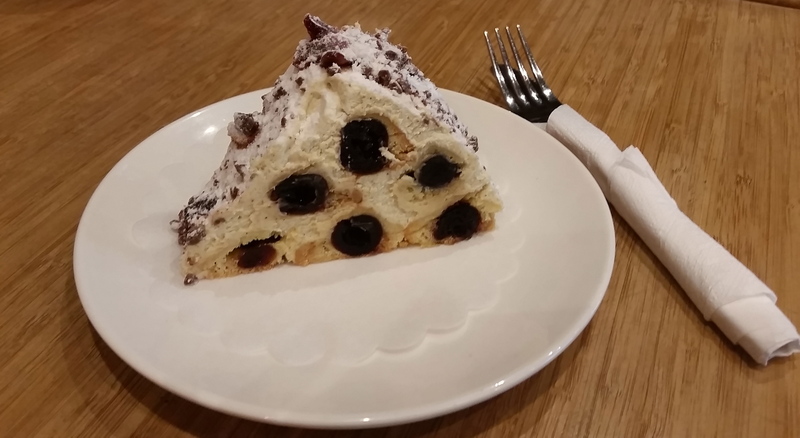 Juicy syrup-soaked Amarena cherries are nestled into a smooth and silky vanilla sour cream and sponge-cake structure, perfectly complementing each other. This was such a vibrant and unique dessert, the cherries with a sweet and punchy pop of flavour, against the tang of the light vanilla sour cream. Next up was the Napoleon, indeed named after the French Emperor with a long history of how this dessert came about.This dessert was developed from the original French pastry, the "mille-feuille". 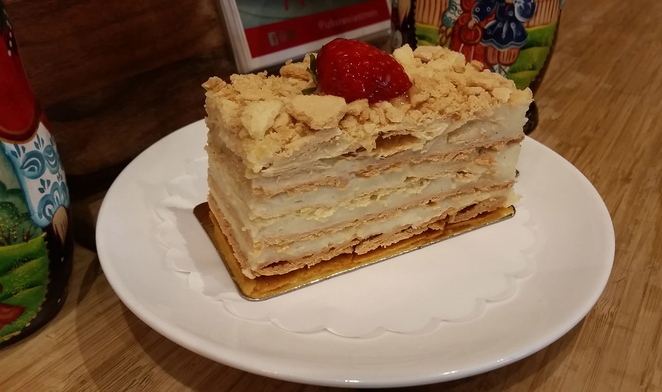 Described on its label as having layers of "flaky pliable dough and gentle Russian custard", if I had to compare it to something more familiar, I would say it was like a deluxe vanilla slice. Creamy vanilla custard layers, separated by a flaky pastry dough, topped off with a fresh strawberry, what's not to love. Finally, we finished off this Soviet smorgasbord with, the Honey Cake. Softly sweetened layers of honey cake are interspersed with whipped vanilla sour cream, topped with blueberries; really simple, really satisfying. The original creation originating back in the 1800's, created for Elizabeth, the wife of Alexander I, Emperor of Russia. A new recruit to the kitchen staff was unaware of Elizabeth's dislike for honey and decided to impress her with his combination of tangy sour cream and sweet honey, to be known as, Honey Cake. She loved the cake and was surprised to discover its secret ingredient, grateful to the chef that he had awakened a new appreciation in her for the sweet taste of honey. At the end of the night we were obviously totally stuffed from our Russian feast, however, with the opportunity in front of me, I just had to grab a few things for family and friends to try at home too, including a slice of apple pie, a piece of Bird's Milk cake, a Poppyseed Scroll, two Pirozhkis, more Izba and a slice of Babka (Seinfeld-lovers unite)...that was all. There is a definite theme with all the food found at Izba, other than the sour cream (which is delicious, so please don't be afraid if you're thinking it's an odd dessert ingredient), it's the fact that there's no fuss, there is only simplicity and ingredients that serve a purpose, which is to provide the most complimentary flavours and textures to satisfy the tastebuds. The food is comforting and brimming with a sense of history that can't help but make you feel full in your tummy and your soul. Why? These Russian delights are so tasty and definitely worth trying, be adventurous and get stuck into something new. Where: 579 King St, Newtown - 10min walk from Newtown train station, 5min from St Peters train station. 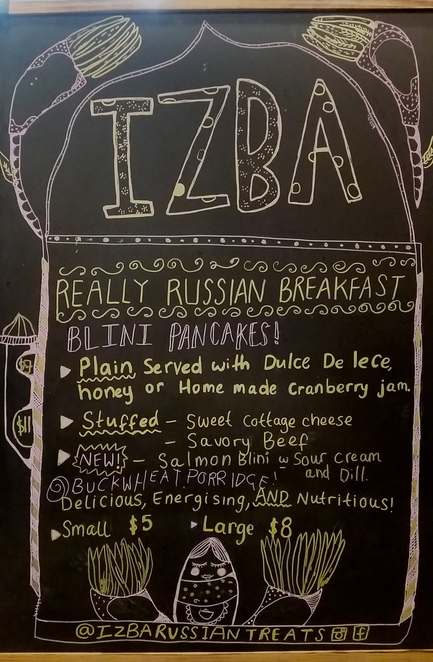 The Izba cake looks like something unique, and blinis sound very nice. Interesting to learn what makes blinis different from crepes. It all looks very tasty.